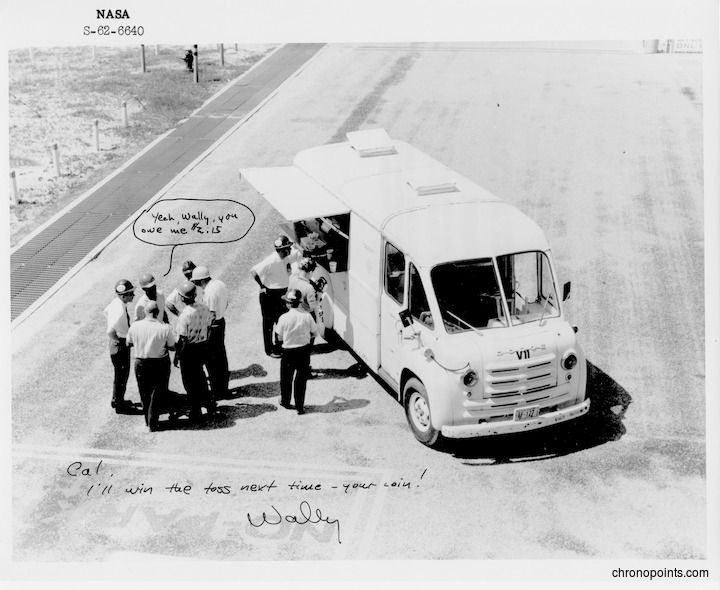 During Project Mercury, the program to launch the first American into space, astronauts would visit the Cape Canaveral Air Force Station (AFS) in Cape Canaveral, Florida, and would often eat lunch at a lunch truck because of time limitations and lack of places to eat. This photograph shows Mercury 7 astronauts Wally Schirra (1923-2007), the fifth man launched in Sigma 7, and Gordon Cooper (1927-2004), the sixth man launched in Faith 7. 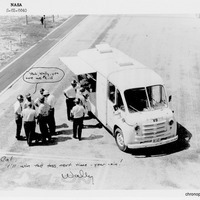 This photograph also shows Launch Complex 14 (LC-14) manager Dr. Calvin D. Fowler and others getting lunch at a "roach coach" at the Cape Canaveral AFS during a visit for Project Mercury. Cal, I'll win the toss next time - your coin! Astronaut Group 1; astronauts; Cal Fowler; Calvin D. Fowler; Cape Canaveral; Cape Canaveral Air Force Station Launch Complex 14; Gordo Cooper; launch complex; Launch Complex 14; launch complexes; LC-14; Leroy Gordon Cooper, Jr.; Lunch Wagon; Mercury; Mercury 7; Mercury Seven; NASA; National Aeronautics and Space Administration; Original Seven; outer space; Project Mercury; space exploration; space programs; Wally Schirra; Walter Marty Schirra, Jr.
“Lunch Wagon at the Cape Canaveral Air Force Station Launch Complex 14.” RICHES of Central Florida accessed April 23, 2019, https://richesmi.cah.ucf.edu/omeka/items/show/4960.